Over time, the combined effects of weather, salt, gasoline and oil will damage asphalt, leading to cracks that allow water into the asphalt base and cause eventual pavement breakup. 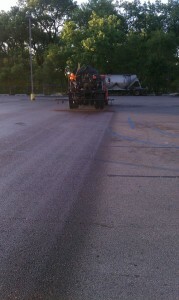 Completely resurfacing a parking lot can be an expensive proposition, but that’s not your only option. Let us show you how the regular sealcoating and crack filling of blacktop can extend your asphalt life and produce a savings of more than 300% in maintenance costs. We also can re-stripe your parking lot, giving those old lines, markings and directional arrows a fresh, new look. 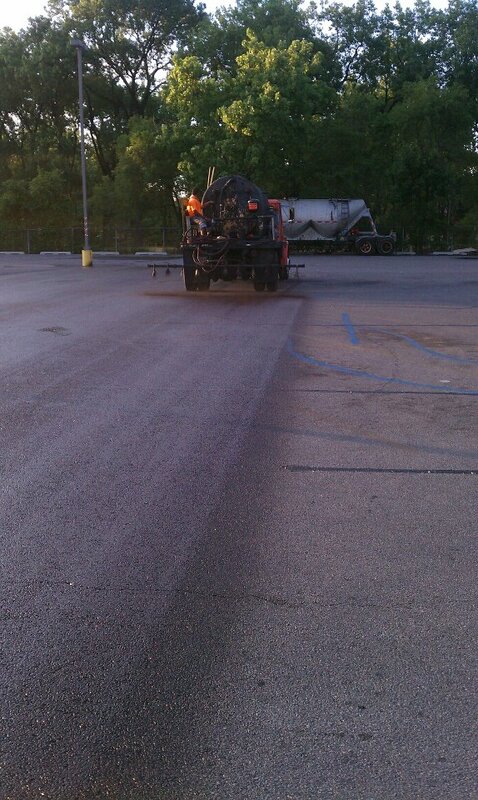 Sealcoating is one of the most important elements of maintaining your asphalt parking lot. A sealcoat consists of either coal tar or asphalt emulsion material mixed with fast drying additives, polymer hardeners and water prior to installation. Pavement sealing is used to protect asphalt surfaces against gasoline, oil, salt, water and other harmful products. Applications of ONE or TWO coats depending of the condition of the lot are available. Sealcoat should be applied at a minimum every 24 moths depending on traffic conditions. When covered with a dark black seal, pavement looks and wears like new. Parking lot sealcoating helps restore the look of your complex and enhances the curb appeal of your property. Sealcoating fills surface voids which reduces the depth to which oil or gas can penetrate the pavement. Sealcoating acts as a waterproofing barrier which minimizes the amount of water that enters the pavements surface. Keeping water out of the subgrade helps prevent frreze/thaw expansion and contraction of the pavement. Coal Tar Sealcoating is impervious to gas and oil spills. Asphalt pavement that is not protected during hot weather can begin to breakdown and soften when gas and oil spills reach the pavement. Once the sealcoating is complete you will find a smooth surface free of voids where dirt can collect. Restaurants benefit from a sealed parking lot because it will protect the pavement from the heavy stream of a power washer along with the chemicals that are typically used. Prior to pavement sealing all major cracks must be filled, pot holes repaired and oil spots cleaned and primed. Once the pavement has been repaired we will used forced air blowers and steel brooms to loosen any dirt that might have accumulated over time. Tru-Seal will carefully edge around concrete areas to maintain a clean look and preventing over spill prior to mechanically spraying or using a squeegee to apply sealcoating material. The recommended weather temperature for sealcoating is 55 degrees and rising. Dry weather for at least 8 hrs after application is necessary to prevent the seal from washing away. Keeping traffic of for a minimum of 18-24 hours after application will ensure that the sealcoating material has hardened enough to resist the heavy traffic. If this time frame is not practicle, Tru Seal will sealcoating in separate mobilizations to maximize convenience of our customers. The use of sprinklers or power washer on freshly sealed areas is not recommended for at least 4 hours after work has been completed.